On Flight 20141019 from Amman to Aqaba six photographs were taken of the dramatic landscape looking west from Qasr Rajif over Wadi Suweid cutting through the sandstone peaks. Unbeknownst to us at the time, the photographs capture the site of an Edomite Fortress. 'el-Manktaa' (Edomite Fortress) - APAAME_20141019_RHB-0287. Prof. Chaim Ben David alerted us to the existence of the site, known as 'el-Manktaa' to the Bedouins, after he viewed the photographs on our Flickr. His ready knowledge and identification of the site probably due to the fact he had coincidentally visited it just a few months earlier. The bridge to the site as seen from the wadi valley below. Photograph by Boaz Langford, courtesy of Chaim Ben David. 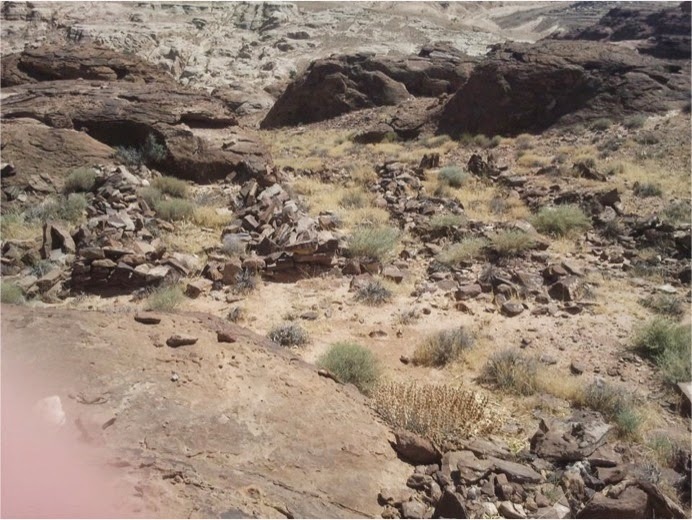 Following information from fellow hikers Eli Raz and Lior Enmar, who were aware of the phenomenon of Edomite mountain strongholds, in July 2014 Chaim visited two new, apparently as yet undocumented mountain strongholds in the sandstone area below the village of Rajef. The sites are about three kilometers south of Qseir, the southernmost known stronghold until this latest discovery. Crossing the bridge to the site. Photograph by Boaz Langford, courtesy of Chaim Ben David. The isolation of the site in the landscape is easily discernible on Google Maps (click here to go to the location). The small Bedouin constructed bridge used by Chaim and his companions to cross into the site can just be seen on the satellite imagery across the fissure that marks the western boundary of the stronghold. Structures are not readily visible on the satellite imagery, or on the low level obliques taken by AAJ, but photographs taken by Boaz Langford from the visit with Chaim show collapsed stone built structures. Evidence of stone structures at the site. Photograph by Boaz Langford, courtesy of Chaim Ben David. Chaim’s information means that we can add the coordinates of these sites to future AAJ flight routes, so that the site may be captured in full instead of in a lucky low level oblique landscape shot. Moreover, our better understanding of this type of site means in future we will be better able to discern these sites from the air. 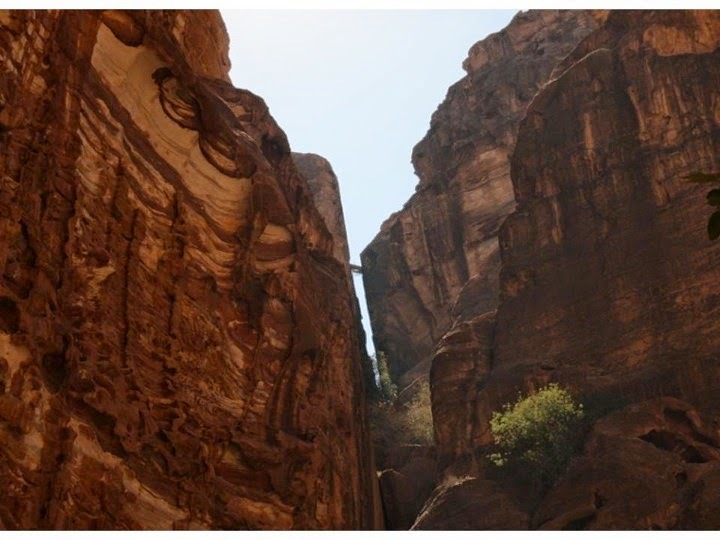 Chaim has offered his knowledge to the identification of many sites taken during the Aerial Archaeology in Jordan project's seasons of flying, and taken us on a couple of his amazing hikes across the landscape to investigate features further. Many thanks! 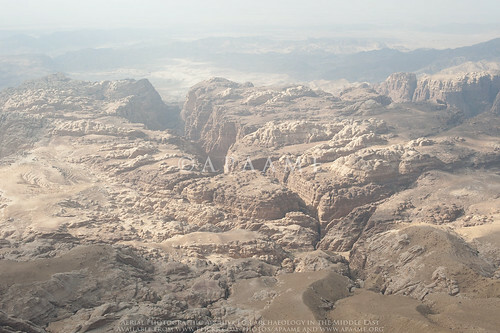 The discovery of these mountain strongholds indicates that the famous fortified Edomite site of Umm el-Biyara (Bienkowski 2011) – above Petra, and, as noted above, identified with biblical Sela‘ – is not unique, but rather is a regional phenomenon. Characteristic of these sites is their remote location on isolated sandstone peaks to the west of and below the limestone massif of Edom. Water-collection installations, as well as storage facilities for agricultural produce were found at these sites and small, arable pockets of soil are often located nearby. Another characteristic of most of these sites is the glaring absence of the fine Nabatean wares so common to the region; the pottery found at these sites was dated by scholars to the Iron Age II (Zeitler 1992: 167–76; Lindner et al. 1996: 153–61; Bienert et al. 2000: 127–33). According to Lindner, these sites were first settled in the seventh century BC by the Edomites, but their history and function have not yet been satisfactorily determined. Did the occupants of the strongholds flee from an external enemy? If so, who was that enemy: the kingdom of Judah, Arab tribes, or the Assyrian or Babylonian empires? And perhaps the strongholds reflect internal strife between the inhabitants of the plateau and the central government on the one hand, and the tribes who lived in the cliffs, on the other? Did they belong to bands of caravan robbers passing through Edom, or, conversely, were they part of a fortification system protecting these roads from Wadi Arabah to the mountains of Edom? At least at one Edomite mountain stronghold does seem to have an answer to some of these questions. It is located 5 km from the biblical Edomite capital of Bozra (today the large village of Busayra) and is known as es-Sela‘, just 1.5 km from the village with the selfsame name – Sela‘. The site, one of the candidates for identification as biblical Sela‘ and the “Nabatean Rock of Edom” (Hart 1986; Meshel 2000), was first established as an Edomite mountain stronghold in the seventh century BC. The significance of this site grew with the discovery there of an impressive imperial relief and inscription of Babylonian king Nebonaid )Dalley and Goguel 1997; Crowell 2007). It is reasonable to assume that this stronghold served as a refuge for the king and other Edomite leaders of the Edomite capital of Bozra. One can assume that the Edomite leadership fled there and that it was eventually captured by Nebonaid, who marked his victory over Edom with an inscription on the cliff. It should be noted that neither Sela‘ nor any other Edomite mountain stronghold is situated near a major route from the Iron Age. Therefore we can reject the notion that these sites were either held by caravan robbers or were part of a fortification system protecting the roads from Wadi Arabah to the mountains of Edom. In my view, like Sela‘ near Busayra, most of the other strongholds were also refuge sites for the inhabitants of the permanent settlements of Edom, as suggested in the past by Lindner and Knauf (1977). Almost all of these permanent settlements are found in the highlands of Edom on the limestone ridge at altitudes of 1200–1600 m above sea level and usually near springs. The arable portion of these highlands is a narrow north–south strip bordered by the Syrian Desert on the east and the deep depression of Wadi Arabah on the west. The steep sandstone cliffs where the inhabitants of the limestone ridge sought refuge are just below that ridge. These nine sites shed new light on the biblical descriptions of the rocks (Sela‘) of Edom. Jeremiah (49:16) speaks of “you who live in the clefts of the rocks, who occupy the heights of the hill. Though you build your nest as high as the eagle’s, from there I will bring you down, declares the Lord”. Obadiah (1:3), similarly speaks of “you who live in the clefts of the rocks and make your home on the heights, you who say to yourself, who can bring me down to the ground”. Some scholars (Raabe 1996: 125–126; Fanwar 1992) explained these verses in relation to a single site in Edom, called the Rock (Sela‘), mentioned in connection with the description of the conquests of Judah’s King Amaziah: “He was the one who defeated ten thousand Edomites in the Valley of Salt, and captured Sela in battle…” (2 Kgs 14:7). It turns out that the words of Jeremiah and Obadiah3 refer to the phenomenon of rocks characteristic of all Edom, and not to one specific site. Apart from Qaryat Mansur all the sites are located on the sandstone cliffs just below the limestone ridge where the permanent settlements are to be found. Two unique sandstone formations are visible in southern Jordan, the Disi and Umm Ishrin formations. These formations have produced the magnificent inselberg scenery in southern Jordan. For example, the hand-carved rock monuments of Petra are entirely cut from the Umm Ishrin and Disi sandstone formations. The white Disi sandstone is to be found above the red Umm Ishrin sandstone formation and therefore it is usually nearer to the limestone ridge rising above the sandstone formations. 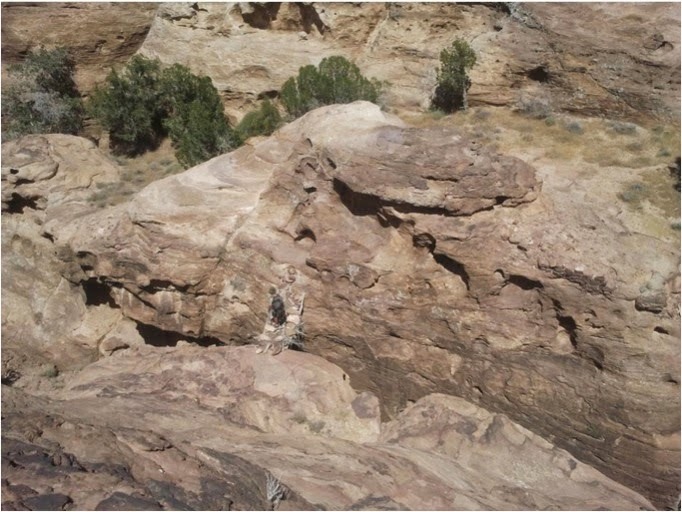 The Disi formation scenery consists mainly of high and rounded white domes, while the Umm Ishrin formation typically features high red cliffs and steep canyons. From the geological point of view these two different settings are the backdrop for two groups of sites: the 'outcrop sites' on the white Disi sandstone formation – Jabal al-Qseir, Khubtha, Baja, Shag Rish and Sela‘ – and the red Umm Ishrin sandstone plateaus above high cliffs where Umm Biyara and Umm Ala are located. As seen in the above table, longhouses – interpreted as storage facilities for agricultural products – were detected only on these two formations and at Qaryat Mansur. The Disi sites are found nearer to the limestone ridge then the others, and in my opinion they were used as refuge sites when the occupants of the strongholds fled from an external enemy, mainly the kingdom of Judah. This proposal fits the date for those sites – mainly the seventh century BC, and the dispute between the kingdoms of Judah and Edom as recorded in the Bible. Lindner M., and Knauf E. A., 'Between the Plateau and the Rocks, Edomite Economic and Social Structure', Studies in the History and Archaeology of Jordan VI (1997), 261-264. Bienkowski P. Umm al-Biyara: Excavations by Crystal-M Bennett, 1960 – 1965, Oxford (2011): 116-125.